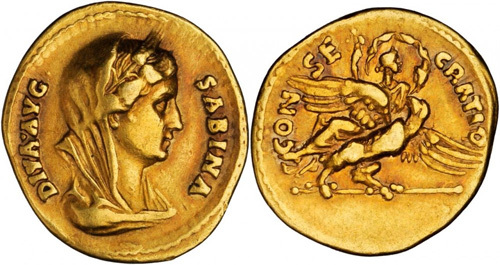 Obverse: SABINA AVGVSTA, Diademed and draped bust right; hair waved, rising into crest on top above diadem, knotted in queue, falling down neck. 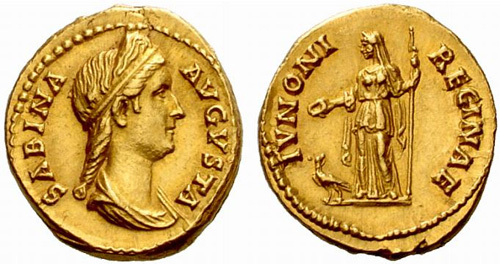 Reverse: IVNONI REGINAE, Juno standing left, holding patera and long sceptre; at her feet left, peacock looking backwards. Obverse: SABINA AVGVSTA, Diademed and draped bust right; hair coiled and piled on back of head behind metal tiara (sometimes double); no queue. 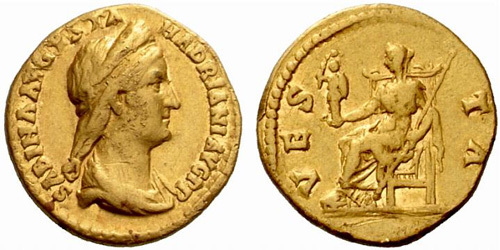 Obverse: SABINA AVGVSTA HADRIANI AVG P P, Diademed and draped bust right; hair waved, rising into crest on top above diadem, knotted in queue, falling down neck. Reverse: CONCORDIA AVG, Concordia seated left, holding patera and leaning left elbow on statue of Spes. 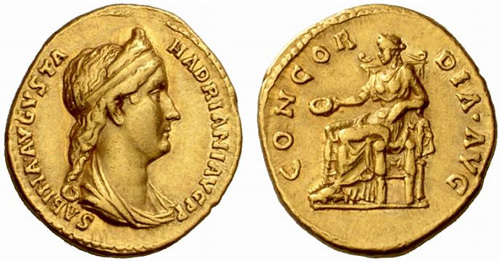 Obverse: SABINA AVGVSTA HADRIANI AVG P P, Diademed and draped bust left; hair waved, rising into crest on top above diadem, knotted in queue, falling down neck. 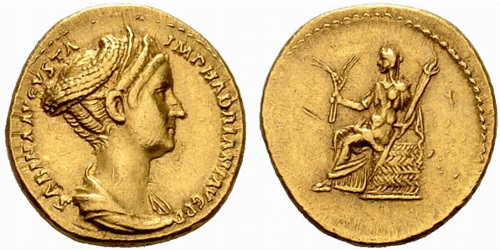 Reverse: CONCORDIA AVG, Concordia seated left on throne, holding patera in extended right hand, resting left arm on statuette of Spes; cornucopia below throne. 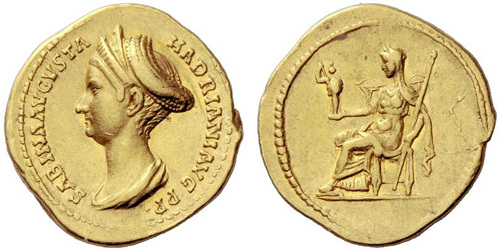 Obverse: SABINA AVGVSTA HADRIANI AVG P P, Diademed and draped bust right; hair coiled and piled on back of head behind metal tiara (sometimes double); no queue. Reverse: No legend, Vesta seated left, holding palladium and scepter. 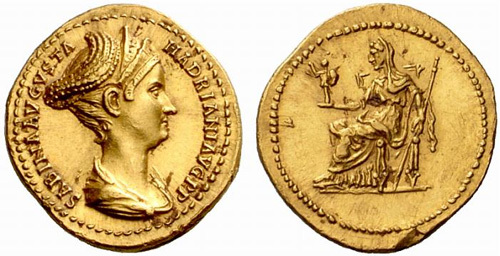 Obverse: SABINA AVGVSTA HADRIANI AVG P P, Diademed and draped bust left; hair coiled and piled on back of head behind metal tiara (sometimes double); no queue. Obverse: SABINA AVGVSTA IMP HADRIANI AVG P P, Diademed and draped bust right; hair coiled and piled on back of head behind metal tiara (sometimes double); no queue. Reverse: No legend, Ceres seated left, on basket, holding ears of corn and torch. Obverse: DIVA AVG SABINA, Veiled and diademed bust right. Reverse: CONSECRATIO, Sabina, holding sceptre in right hand and with a scarf open behind her, borne aloft by eagle right on sceptre. Obverse: DIVA AVG SABINA, bust draped veiled and in wreath of corn-ears right.